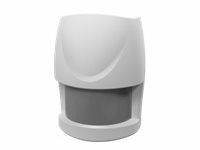 AXIS T8341 PIR Motion Sensor detects motion both day and night, thanks to passive infrared technology. By communicating wirelessly with AXIS M5065 PTZ Network Camera or connected Z-Wave Plus controllers, the motion sensor can be used in small security solutions with less cabling. The wireless I/O connectivity also enables flexible installation as the sensor can easily be moved and adapted to your needs, even for mounting in corners.